People keep eating one of Procter & Gamble's most successful innovations in years: Tide Pods. For years, children have accidentally eaten the poisonous pods. Toddlers sometimes mistake them for colorful candy. P&G responded by putting double-latch lids on packaging. Now #TidePodChallenge has become an online craze, with teenagers and adults posting videos of themselves biting chunks out of the laundry detergent packets. The American Association of Poison Control Centers issued a health alert this week in response to the "spike" in exposure to Tide Pods' toxic chemicals. YouTube and Facebook both said they would pull videos of people taking bites out of pods. P&G has been doing damage control all week. "We are deeply concerned," the company told CNN in a statement Thursday. "Nothing is more important to us than the safety of people who use our products." Tide's Twitter feed has turned into a rapid response center, instructing people who ate Tide Pods to drink milk and call a poison control center immediately. And the brand turned to NFL star Rob Gronkowski for help. "What the heck is going on, people? Use Tide Pods for washing. Not eating," Gronkowski said in a video. The crisis threatens a product that P&G spent more than a decade developing. 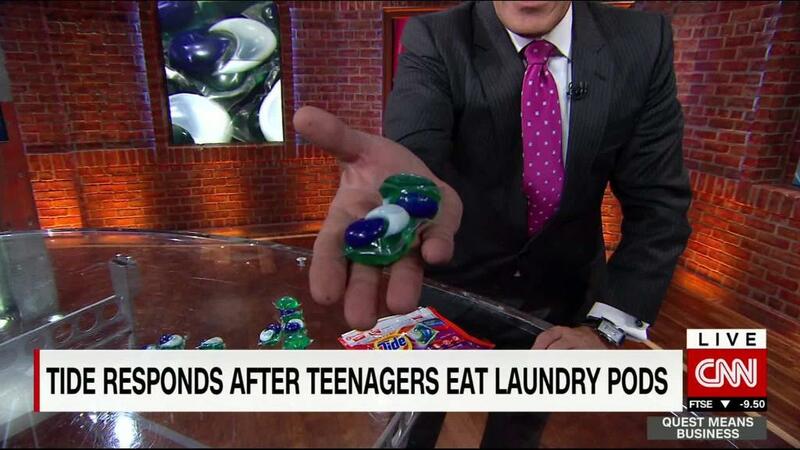 Tide Pods upended the laundry business when they launched in 2012. P&G heralded Tide Pods as the best thing to happen to laundry since liquid detergent. Pods' three-chamber capsule, which contains detergent, stain remover and color protector, gave people an easier way to wash their clothes. "They nailed it," said Ian Bell, head of Euromonitor's home care research. "I don't think the laundry care shelf ever experienced anything that looked that good. It looked out of this world." Pods have helped P&G maintain its top spot in what Bell says is a $49 billion laundry detergent market. P&G controls 26% of the market, followed by Unilever and Henkel. P&G doesn't break down sales by brand, but Bell estimated the company raked in $1.5 billion from pods last year, including Tide Pods and Ariel detergent pods. The two brands hold an overwhelming 80% grip on the fast-growing laundry pods market. Pods are also more expensive than liquid and powder detergent, so P&G's profit margins are higher. Even activist investor Nelson Peltz, who battled P&G for a seat on the board and criticized its innovation machine, applauded Tide Pods. Kim Whitler, a professor at the University of Virginia's Darden School of Business and former executive at P&G, gave the company mixed reviews for its response to the crisis. She credited P&G for enlisting Gronkowski to spread awareness and for working with Facebook and YouTube to remove videos. But it isn't clear who's leading the effort. In corporate crises, Whitler explained, it's important for corporate leaders to communicate with customers. "All the right people at P&G are engaged and there is a significant amount of work taking place behind the scenes," P&G spokesman Damon Jones said. "We're confident these efforts and others in the future will help people take safety more seriously and use our products safely." P&G CEO David Taylor has not spoken publicly about the issue, instead letting Tide become the public face of the cleanup. That strategy carries risks. "It's hard to connect with a box of Tide," Whitler said. --CNNMoney's Michelle Toh contributed to this story.